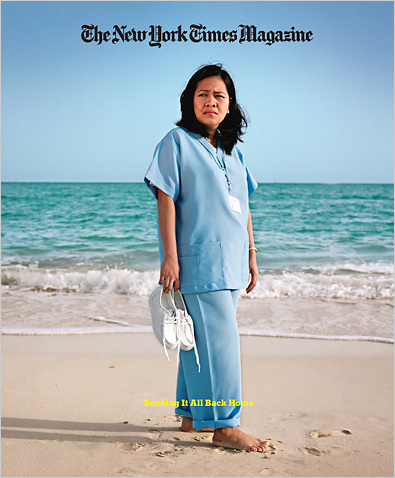 Rosalie Comodas Villanueva, a native of Manila, is a nurse at Al Rahba Hospital in Abu Dhabi. She makes $24,000 a year ”” compared to the $1,200 she made while working in her homeland ”” $4,800 of which she sends home. 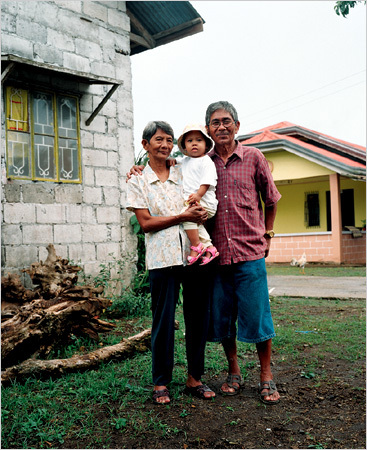 Two of her children have lived with her parents in the Philippines for years. …Deprived of their father while sustained by his wages, the Comodas children spent their early lives studying Emmet’s example. Now they have copied it. All five of them, including Rowena, grew up to become overseas workers. Four are still working abroad. And the middle child, Rosalie ”” a nurse in Abu Dhabi ”” faces a parallel to her father’s life that she finds all too exact. She has an 18-month-old back in the Philippines who views her as a stranger and resists her touch. What started as Emmet’s act of desperation has become his children’s way of life: leaving in order to live. About 200 million migrants from different countries are scattered across the globe, supporting a population back home that is as big if not bigger. Were these half-billion or so people to constitute a state ”” migration nation ”” it would rank as the world’s third-largest. While some migrants go abroad with Ph.D.’s, most travel as Emmet did, with modest skills but fearsome motivation. The risks migrants face are widely known, including the risk of death, but the amounts they secure for their families have just recently come into view. You are currently browsing the Wofflings weblog archives for the day Sunday, April 22nd, 2007.